Many years ago Lichfield's Home Fleet was the envy of all other towns and villages in Staffordshire. Anchored in their home port off the west shore of Stowe Pool its ships were a magnificent sight when viewed against the backdrop of Lichfield Cathedral's spires. The ship's crews were all Lichfield men born and bred who had spent their lives on board their vessels patrolling Stowe Pool's sometimes dangerous waters, but their seafaring skills always ensured that they returned to port unscathed. 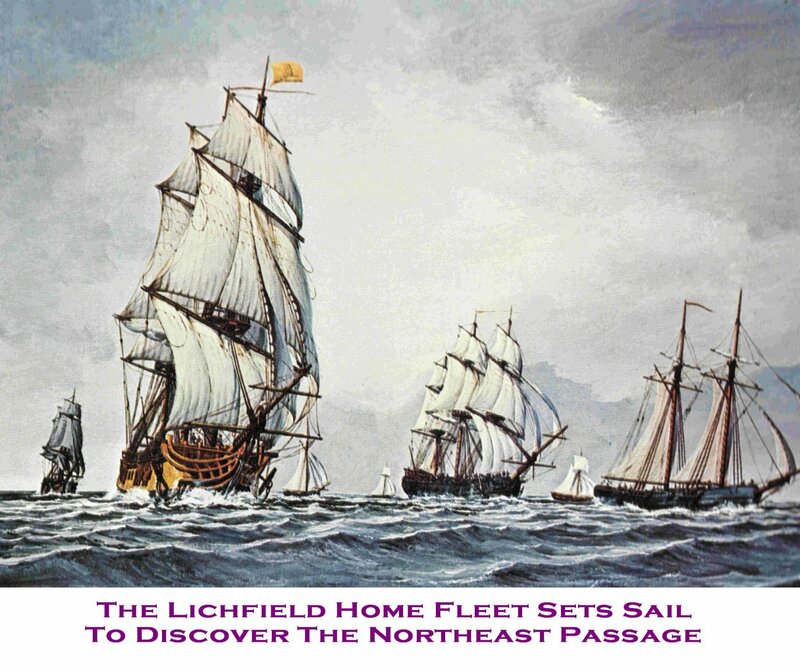 So Lichfield remained the premier Staffordshire port until one day the Fleet weighed anchor and set sail to find a new navigation to Tamworth. This wasn't the first time such an exploratory voyage had been undertaken. For centuries experienced Lichfield navigators had been convinced that what became known as the "Northeast Passage" to Tamworth existed and this had become something akin to a holy grail for the local mariners. There was much flag waving and cheering on their departure and tears too from wives and sweethearts not knowing when they would see their loved ones again. Weeks passed by, then months, then years with nothing being heard from the Home Fleet. Shipmates left behind made many attempts to get the fleet back to Lichfield but they all ended in failure. Then one day whilst passing the cathedral a retired skipper had a vision. Looking skywards he saw not the usual three spires but just two spires with lighthouse in between them with its beam shining brightly out across the surrounding rooftops. This was indeed a sign from God. "That's it" he said "We'll build a lighthouse on the west shore. The Fleet will surely see the beam and be drawn back to their home port". Immediately public subscriptions to a new venture called the Lichfield Lighthouse Company were invited. After the first year's fundraising a total of tuppence three farthing had been collected but an application to the National Lottery for match funding was turned down. Dejected, downhearted and not knowing what to do next, the skipper and his mates were walking down Bird Street one Monday evening and decided to pop into the Kings Head for a quick one to drown their sorrows. Sitting quietly in a dimly lit corner in the back room of the pub with their pint glasses in front of them, First Mate Geordie Jack, suddenly started singing a shanty they all knew well. At first the others looked at him askance and all thought to themselves "Why should he be singing when we are in such dire straits?" But reflecting on the situation they realised that this is what their long lost shipmates would want them to do. Indeed they could be doing the very same thing stranded somewhere deep in the Northeast Passage and it was reassuring to them to think that the sounds of their voices would mingle somewhere in the ether. So one by one they all started joining in the choruses. When the first shanty ended Kapitan Col, straightway started another and the room was soon filled with song. This began to attract passers by in Bird Street and gradually they started to drift in and join in the singing. This lifted the spirits of the lads and they were soon exchanging pleasantries with their new found friends. After the landlord had ejected everyone from the pub they all agreed, lying in the street outside, that they had had a very jolly time and would be back in a couple of weeks for a reunion. The gathering of shanty singers became a regular fixture at the pub and the plight of the poor sailors on the Home Fleet ships was soon forgotten. So that's how the Lichfield Lighthouse Company came into being. But what about the plight of the Home Fleet and the stranded sailors, what happened to them? Are they still lost somewhere in the Northeast Passage? Did they perish when they were lured into the Barton Triangle by a mermaid? Or did they run aground somewhere near the Tame Otter, settle down and intermarry with the locals. Well there's one thing that's certain, there's no point asking the skipper and the lads, they are too pre-occupied singing sea shanties at the Kings Head every first and third Monday. This is an abridged version of the complete story as full disclosure may result in criminal proceedings for blasphemy, libel, character assassination etc.